Presidential Affairs Minister Freedom Sikazwe Tuesday evening beat up Roan MP Chishimba Kambwili in Parliament. The incident happened when Kambwili was debating the 2019 budget and Sikazwe kept interrupting with stupid comments promoting Kambwili to calll him a witch. It took a horde of other MPs to restrain Sikazwe who reached out for Kambwili’s throat while throwing punches in the Chambers. “I was debating about debt, but Sikakzwe kept on interrupting with running commentaries. He was shouting ati ‘iwee ikalafye (just sit down) you were part of the decision’. He was saying ‘just sit down that’s rubbish debate’. Then I said Mr Speaker don’t worry about Honourable Sikazwe, he was supposed to be a witchdoctor at some village, so that’s why he is making noise,” Kambwili narrated. Asked what he was going to do about the incident, Kambwili said it was useless to take any action because last time when he reported Bowman Lusambo for slapping him, the offender was given a “rubbish punishment”. “When people have failed and they are feeling the effects of failure, they are bound to get upset like that. So the best is just to ignore them. Those guys are wounded because they know that things are not going well for them. 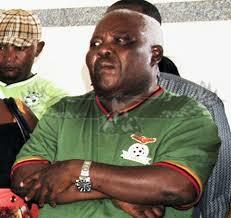 They know that they have brought a lot of suffering on the people of Zambia,” said Kambwili. When contacted, Sikazwe said Kambwili deserved it. “If he is claiming that he was punched, then he deserves it. But people were there, you can ask them. I would have punched him but I was restrained by the people. I didn’t follow him in the car park, I found him on the Roadside and he was waving at me when I was driving out,” he said. Asked what made him angry to attacked his fellow lawmaker, Sikazwe said he got annoyed because Kambwili called him a witch. “It was the usual debate, he was debating and in his debate, he was alleging that this government, whatever money they are getting, they are getting the money ‘question!’ that is what followed, where we said ‘question’. And his comment now was that ‘people who are saying question, like this one seated here Honourable Sikazwe is a witch. And that’s what annoyed me. You can go and get the verbatim from parliament, that made me annoyed,” he said. Asked if he was going to punch him if there were no people to restrain him, Sikazwe said he was going to punch Kambwili hard because he is a stupid man. “Yes I would have punched him seriously because he is very stupid,” said Sikazwe.